The e-commerce group will transfer its small online pharmacy unit to a listed affiliate for $2.5 bln in shares. The unit’s market value promptly soared 65 pct. Becoming Alibaba’s sole online health vehicle is valuable. But the financials of the deal don’t justify the excitement. 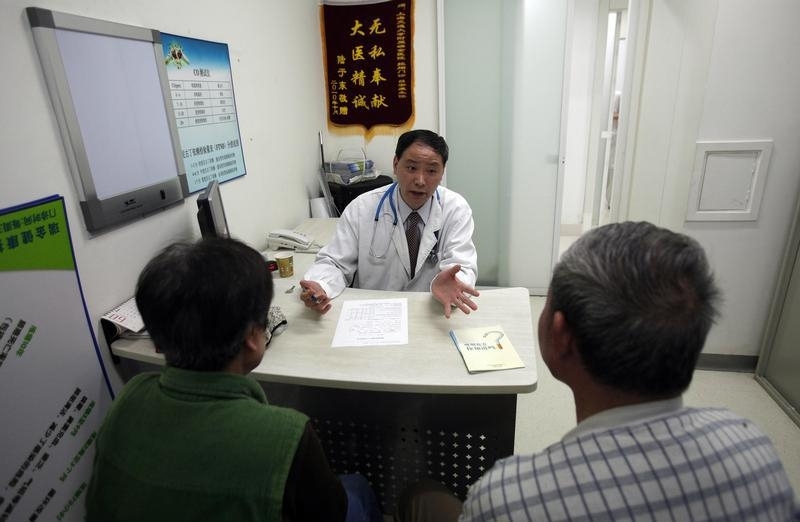 Doctor Lu Ankang talks with patients with respiratory problems caused by smoking at Ruijin Hospital in Shanghai April 27, 2011. Chinese e-commerce group Alibaba announced on April 15 that it would transfer the operations of its online pharmaceutical business to its Hong Kong-listed affiliate, Alibaba Health Information Technology Limited, in a transaction worth HK$19.4 billion ($2.5 billion). Alibaba’s equity ownership of Alibaba Health will increase up to 54.6 percent from 38 percent. The online business is a transaction platform for online pharmacies. It also has a licence to process online pharmaceutical sales. In the year to March 2015, the business generated revenue of 102.6 million yuan ($16.5 million) and net profit of 70.9 million yuan. Alibaba Health will issue 2.96 billion new shares and 409 million convertible shares to Alibaba. It will also issue 313 million new shares to Chen Wen Xin, the brother of the online platform’s executive director. For the purposes of the transaction, Alibaba Health shares were valued at HK$5.28 each, a 22 percent discount to the last closing price. The convertible shares were priced at HK$5.81 each. Alibaba Health shares jumped 65 percent to HK$11.2 on the morning of April 15.